It is official. Our school year has begun. And I, along with so many of you, have also entered that time where, once again, we are facing those busy mornings and searching for tips and tricks to get us out of the door without all of that hectic stress. We have high hopes and anticipations that this will be the year. The year that we are on time. 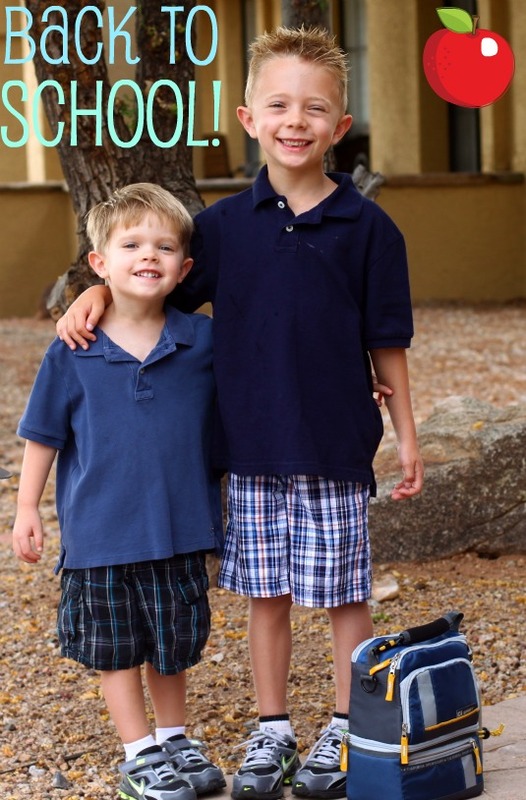 The year that everyone skips happily out the door with all necessary homework, permission slips, and lunches in tow. The year that we can give ourselves a pat on the back for our new organizational skills. This will be that year. Right?…Right? I have a special printable tool that just may help with one aspect of that below. But first….I have a question! How come none of you told me that by packing lunches the night before, I would preserve an incredible amount of my sanity? Seriously! Where on earth have I been? I honestly am not sure how it has taken me over two years of rushing around in the morning to figure this out. I am sure most of you already knew this and are rolling your eyes at me being so slow on the uptake. But I just had to share my joy in this new-found calmness I have discovered in the mornings. Okay. Back to the real reason for this post. 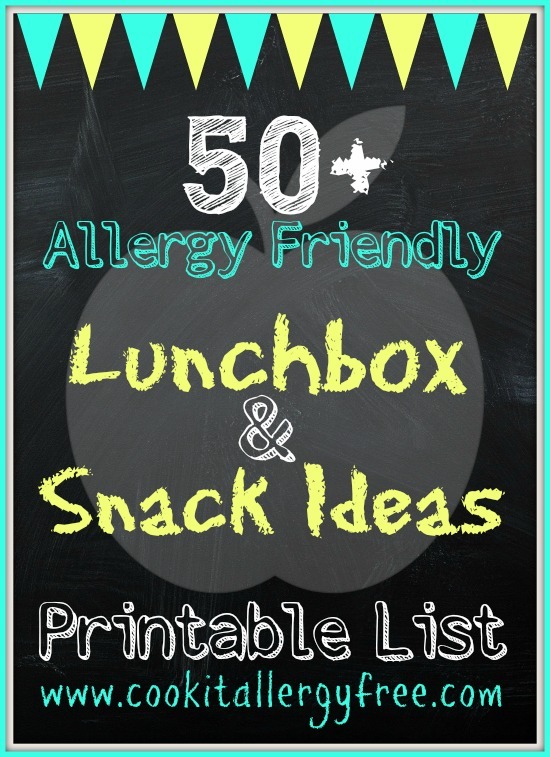 I have put together a printable list of over 50 Mix-and-Match Allergy-Friendly Lunchbox Ideas for you. It is long, but I just wanted to show you the many possibilities to keep you out of those lunch-packing ruts that we all fall in to. So. Print out the list. Bring it to the grocery store. Stick it on the fridge. Keep a copy on hand to whip out whenever you feel like you are running low on creative juices and come up with a host of new ideas. Note: this is an updated and modified version of my allergy free and gluten free lunch post I did last year and from my lists in my iPhone App and iPad App. 1. Nut Butter or Nut-free Butters (such as Sunflower-Seed Butter). Top with fruit slices or Jelly plus 1-2 tsp Ground Chia or Flax. 7. Mix together: Chicken (or tuna) shredded, diced celery, diced apples, diced grapes, Organic Mayonnaise (or Egg-Free Version) to taste, squeeze of lemon juice, Salt and pepper to taste. 2. Cooked brown rice or quinoa tossed with diced chicken, broccoli florets, dried cranberries, coconut oil, a splash or orange juice, salt and pepper to taste. 6. Meatballs and Sauce in a Thermos – send allergy-friendly bread or rolls for a Meatball Sub, if desired. 9. Trail mix with Dairy Free Dark Chocolate pieces for a treat (Enjoy Life Foods has great Nut-Free Trail mixes) or make own with: chopped almonds (if not Nut-Free), raisins, dates, apricots, cranberries, sunflower or pumpkin seeds, shredded coconut, etc. 13. Safe Granola in a container with a separate thermos of Dairy or Dairy-Free milk to pour over it. What an AMAZING list! Thank you so much!!! My daughter is only three, but I’m always looking for new lunch ideas for both of us, thank you for so much inspiration! I’m going to link this to my blog so more people can access your fantastic ideas. Thanks so much, Andrea!! I started the list last year, when I was getting frustrated with packing the same few things all of the time. It is so much more fun to get creative! And my kids now get excited to see what crazy new things mom packs for them! 😉 Thanks for linking to it, by the way!! What a great list Kim, thanks for sharing! We suggested to Rudi’s facebook fans to come check out this list because you really thought of some awesomely creative ideas! Thanks for sharing! WOW! Thank you so much. Such great “Out of the box” ideas not only for my kids but for me everyday! Thank you Thank you Thanks you for also linking may recipe’s to it! This list is FANTASTIC! Thank you for the wonderful ideas! Kimmie, I was waiting for this list after you told me it was being published. I will print it out and stock up just for Michael and me. You never cease to amaze me. Love, Love, Love your enthusiasm and energy. Of course I love the picture of my two favorite boys! THANK YOU, THANK YOU … for this post. I feel so behind in planning for school and home lunches. You put a lot of work into this … and it is greatly appreciated! If nothing else, I can go share this around cyber space. There are lots of moms looking for school lunch ideas right now. Melissa, you crack me up! I have a feeling I am a bit older than your kiddos since I am creeping onto 40, you silly lady!! Thanks so much for sharing it around the web, by the way!! Wow! This is such a great resource Kim! Amazing actually. I’m glad I’m getting the “pack the lunches the night before” tip as Callum starts school! Your boys are so adorably cute! What an awesome resource!! I shared the link on my FB page. Thanks for all of the hard work that went into this post! First of all those boys are soooooo cute! I miss my boys being little. Secondly, why the heck do schools start so early these days? We never went back to school until after Labor Day. Thirdly YES, packing lunches the night before will preserve you sanity (and ad early as is possible get them to start packing their own lunches) and finally GREAT LIST! Oh, how I love that photo of your boys! They are simply adorable. 🙂 And this listing is phenomenal. I just shared it on my gfe Facebook page. Thanks, my dear! Wow, what a list! I was just thinking about (and stressing about) what to pack for my little guy once school starts. It has been so easy over the summer, but once he has to bring food to school, I have a hard time figuring out what to give him day to day. Thank you for putting this together – and your boys are absolutely adorable! I’m a college student with a class away from home one night a week, and with meetings for a local non-profit every other week, so it’s great to have this list of ideas for myself as well. Another good idea, with brown rice, are onigiris. You can fill them with tuna, smoked salmon, vegetables, pickled plum (watch out for MSG), etc. You can also brush them with miso paste (fermented foods are so good for you) or tamari and then grill or pan sear them. Yum! Hi Amanda! The onigiris sounds amazing. So many ideas!! I am going to have to try some of your suggestions! Thanks! You have provided sooo many good ideas here! Thanks so much for sharing them and thanks so much for your sweet comments on my blog, always. The cookies that I made are great for kids to help out with. Let me know how they turn out for you! Thanks so much, Candace! The sweet words go both ways! Always so appreciated! 😉 Hope you had an awesome weekend! By the way, I made your cookies with my kids this weekend. They were such a total hit and so easy for them to do! This list is awesome! My kids don’t go to school but quick and easy stuff that keeps for day trips is also very welcome. Thanks!! I totally use these lunch ideas for home and day trips for all of us too, so they work for everything! Thanks! Awesome post Kim! Your little guys are ADORABLE. But they have adorable genes on both sides of the family, so not too surprising. Thanks for the mention, I was totally surprised and excited by it after reading the post! I have such problems packing lunches here, the weather is in general so hot that even with ice bricks, I don’t feel very confident with sending much more than a plain sandwich. Our kiddies go back to school at the very hottest time of year, just as the temperatures hit about 35-40*c. There are some lovely ideas on this list, thanks! Wow that’s a lot of ideas. You’re kids sure are lucky to have you as their mom. I’ll be stealing some of these ideas for our lunch boxes. I’ll also be linking to this great resource. Thanks! Thanks Diane! But, I think that if we are talking about lucky kids, yours would be at the head of that list. You are one crazy-amazing mama with all that you do for them!! Big hugs!! Thanks so much, Melanie! I use these ideas on me and on my hubby all of the time as well. Otherwise, I find myself falling into the same lunch ruts over and over again! I love this, I love this, I love this! Thank you for putting these ideas together…where we could see them, too. Great list! I just did a post on my kids favorite back-to-school lunch ideas and easy breakfast favorites that are gluten-free. Love all your ideas as well! Fabulous ideas! Love this post and so great for all the moms out there. Thank you for sharing. Will you be at the Gluten-Free Expo in Dallas next month? I’d love to meet you if you’re going. Have a great weekend and keep up the amazing blogging! Hi Amie! Thanks so much! I will not be able to be at the Expo. I have about 30 other things going on that weekend and just cannot make it happen, unfortunately! I would have loved to meet up with you! I think it is going to be an amazing line up of speakers, presenters, and vendors!! This is a great list. I don’t have kids but these ideas for lunch (and even light dinners) are quite welcome. Thanks. Thank you what a great list. 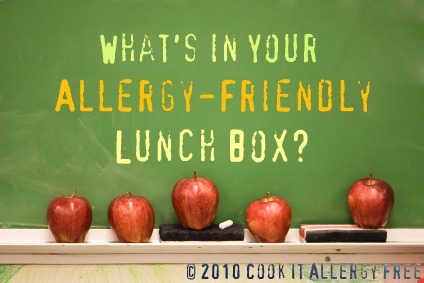 We are just starting school here in Western Australia and I was just looking for some new ideas for my son – he has dairy, egg, and sesame (to name some) allergies. Could I please reblog your article on my blogsite: http://www.intrepidallergymum.com? Is it okay to add a link to your site, in the sidebar of my blog? You have some wonderful inspiration for lunches here. Thanks! Does any one know if they make a dairy and soy free yogurt? I’m allergic to everything under the sun plus have IBS, looking for something different than my ho hum diet.